The penalties for a probation violation can be severe. Typically, a judge will view a violation as a serious allegation and a breach of the trust originally placed in the defendant. When a probation violation is filed all penalties for the original conviction are possible. These can include prison time, increased fines, longer and more extensive probation terms, and monitored sobriety. Because of the seriousness of a probation violation, it is crucial that you have an experienced criminal defense attorney with a proven track record. 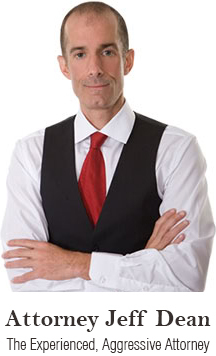 Jeff Dean has that record and he is widely recognized as one of the most successful attorneys in this area of the law. When an individual pleads guilty or is found guilty in a criminal case, the court generally enters a conviction and places the person on probation. Generally, probationary conditions include fines, serving time in jail, community service, electronic home monitoring, payment of restitution, completion of psychological or chemical dependency treatment, remaining alcohol and drug free, and refraining from committing new offenses. Probation violations are classified into two categories, direct violations and technical violations, and these help determine the nature of the offense. Direct violations are common intentional violations, such as failing a drug or alcohol test, not adhering to guidelines of house arrest, or not attending drug counseling. While these violations are considered intentional, they are certainly still defendable. Technical violations, on the other hand, are offenses that are oftentimes unintentional. With technical violations, it is easier to prove that the error was not necessarily the defendant’s fault. Examples are an individual believing that his or her probation is already finished, or is unclear as to when probation was actually completed. Failure to follow the conditions of probation will result in the filing of a probation violation report, which will require returning to court. If you deny violating probation, then the case will proceed to a contested probation violation hearing, called a Morrissey hearing, where a judge examines evidence from both sides, and decides whether or not the probation was violated. If you admit to a probation violation or the court determines that a violation has occurred, then your probation may be revoked and your sentence executed, or your probation could be continued with additional consequences or with no additional consequences. To fight your alleged probation violation, you need an experienced, aggressive attorney. Jeff Dean, one of Minnesota’s most respected defense attorneys, has had extensive experience in probation violations cases. He has successfully negotiated favorable results in probation violation cases across Minnesota.